Striking marketing? Promoseeds offers you a unique concept! How do you create attention for your business, service, or organisation in a strong and positive manner? Which promotional items will you be showing at the fair? How will you manage to leave a positive impression on the people who see your products? Promoseeds offers the answer to all these questions! We provide promotional material that will be received enthusiastically by your audience and, by virtue of being ‘green’ premiums and promotions, will prove to be really useful. 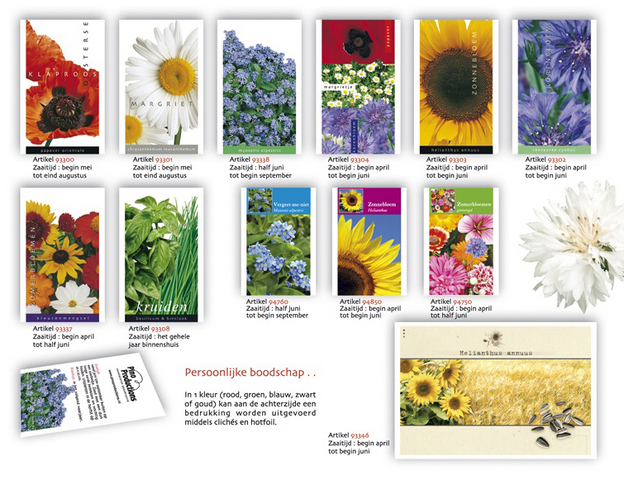 Think of striking postal mailings which contain flower seed packets, exhibition giveaways, bottle bags, etc. Naturally, Promoseeds will produce the packaging according to your wishes and your corporate identity! The ultimate marketing campaign is a campaign that generates a high degree of attention at low cost! Promoseeds and Seeds4garden.com have put their heads together and joined forces to create this concept and find a way to market it strongly. Our philosophy is that most - if not all - people feel good in the presence of flowers. And even better: flowers that they have sown themselves! 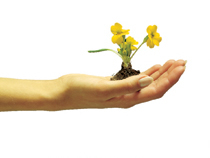 Wouldn’t it be great if the recipient of your green promotion thinks of you positively when the flowers come into bloom? Hold this thought if you think your audience might appreciate this... and then quickly have a look at promoseeds.nl! Promoseeds gives your corporate image a boost! You would like to bring arouse interest in your company in a positive manner. You would like to do this with unique promotional material, which also integrates seamlessly with your corporate identity, your product or your promotion. Promoseeds has your needs in mind! The packaging of your green promotional material is created according to your layout, matching your marketing campaign, product or corporate identity. At Promoseeds you can choose from a very wide range of flower bulbs and seeds, as well as herbs and vegetable seeds to match the season of your promotion. Promoseeds works with the best advertising agencies and graphic designers in this field, ensuring that your message will have maximum impact on your target audience! Leave the best impression with Promoseeds!